Percy Shaw (1890 - 1976) was born in Halifax in West Yorkshire in 1890, the son of Jimmy Shaw, a dyer’s labourer, who worked at a local mill. When he was 14, he worked as a road mender. Shaw was inventive, even at a young age, and his catseye idea for lighting the way along roads in the dark was pure inspiration. When the tram-lines were removed in the nearby town of Bradford he realised that he'd been using the polished strips of steel to navigate. The name 'cat's eye' comes from Shaw's inspiration for the device: the light reflecting from the eyes of a cat. In 1934, he patented his invention (patent No. 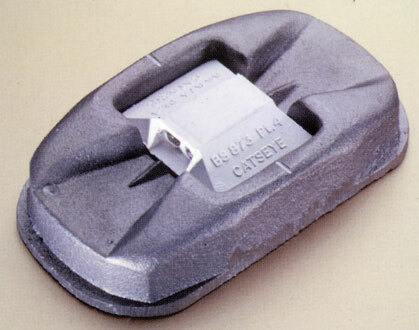 436,290 and 457,536), and on March 15, 1935, founded Reflecting Roadstuds Limited in Halifax to manufacture the items. The name Catseye was their trademark. He founded the company with £500 of capital and opened a factory beside his home in Boothtown. In 1936 Shaw conducted a public experiment at his own expense by installing fifty Catseyes on a dangerous stretch of road outside Bradford. 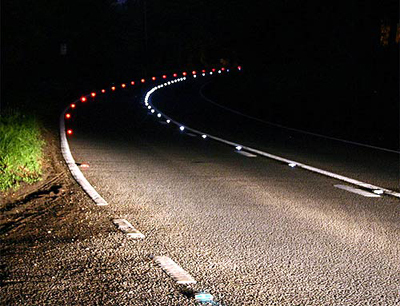 The number of accidents on the road fell sharply and local drivers attributed this to the visibility provided by Shaw’s road markers. Concerned about the growing number of night-time road accidents, the Department for Transport staged a competition in 1937 to find a robust road reflector. 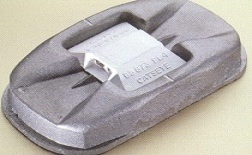 Percy Shaw won the competition with the Catseye after rival models either broke during the trial or were deemed to be ineffective. Nonetheless 'Reflecting Roadstuds' found it difficult to drum up orders until World War II when driving at night became even more perilous because of the government-imposed blackouts to thwart German bombers. The company accelerated its expansion after the the war and eventually occupied a 20 acre site in Boothtown. 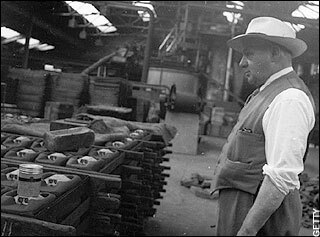 At its peak it employed 130 people to manufacture over a million Catseyes a year for export all over the world. Shaw’s eventual design consisted of four glass beads placed in two pairs facing in opposite directions, embedded within a flexible 'rubber moulding' which was mounted on a 'cast iron base'. The device was buried in the road and fixed in position with asphalt. When vehicles drove over the dome the rubber contracted and the glass beads dropped safely beneath the road surface. Aiming for minimal maintenance, Shaw even devised a way for his Catseyes to 'clean themselves'. The cast iron base collected rain water and whenever the top of the dome was depressed, the rubber would wash rainwater across the glass beads to clear away any dust or grime that had gathered there, just as the human eye can be cleansed by tears, simple and effective. Such a success was the invention of the "cat's eye" that in 1965 he was rewarded with an 'OBE' for services to exports. Eventually, their use spread all over the world. Shaw’s invention is credited with having saved many millions of people from death or injury in accidents. He and his company remained in Boothtown, where Shaw lived until his death in '1976'. His home was void of carpets, curtains and other comforts, but a pair of Rolls-Royces would be parked outside and he stocked the cellar with crates of Worthington’s White Shield, his 'favourite beer'.